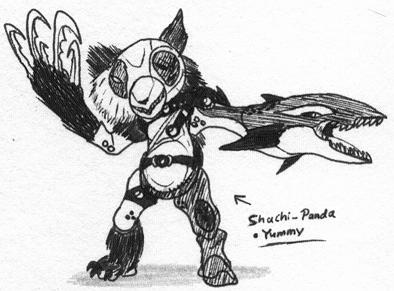 The Shachi-Panda Yummy is a panda Yummy augmented with killer whale features that is created by Kazari by using the desires held by Kiyoto Maki to see his deceased sister Hitomi (who is physically identical to Chiyoko Shiraishi). 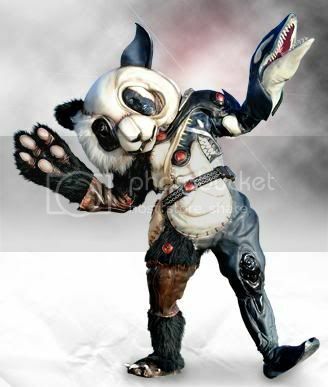 The Shachi-Panda Yummy has a bear hug-like attack and claws on his right arm, along with a spinning attack with the killer whale-like left arm. Eventually, Kamen Rider OOO Takajaba keeps the Yummy occupied long enough to be destroyed by Kamen Rider Birth's Cell Burst.